I really like how Mouse is also in Dizzy. A good read. This book is wierd and unique in many different ways and also catches your attention once you start reading it. Like oth books its hard to put the book down and when you do you hink what will happen next. This is my favourite Cathy Cassidy book EVER 10/10!!!!! 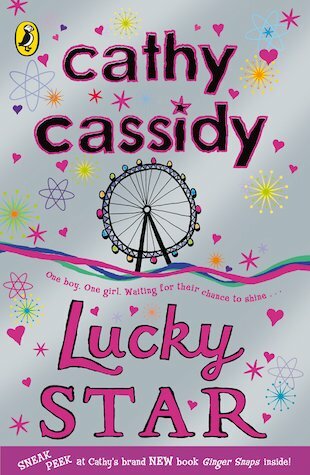 Lucky Star is a sequel to Cathy Cassidy’s book, Dizzy. It is a really dynamic book, and I urge anyone to read it. I feel really sorry for mouse, and this book is so hard to put down!! Mouse is always getting into serious trouble, and when he meets Cat, it goes the other way… Mouse is trying to get OUT of trouble. Cat’s trying her best to land herself IN it. But Mouse thinks Cat might not be telling him everything… This was my second Cathy Cassidy book and now I’ve read all of them! * * * * *!